We had a friend staying last night. I know she loves Mexican food and I knew I didn’t have all day to spend in the kitchen. I’d made this recipe from Voluptuous Vegan before and knew it was a winner. 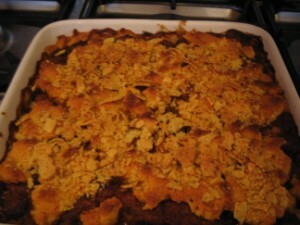 It’s a very rich chilli which is baked in between 2 layers of cornbiscuit. I brought sackloads of dried chillies back from America last time I went so I had all the ingredients. The guacasalsa has cucumber in it, which I know our friend hates, so I replaced it with mango, and I think it was even better that way. Cornbiscuit or cornbread isn’t really known in this country, and I’d never had it before I went vegan, so I don’t know how this compares, but it’s certainly delicious. I love the way the vinegar reacts with the bicarb and goes all frothy. You can make the chilli in advance as long as you don’t mix the wet ingredients in with the dry for the cornbiscuit until the last minute. It’s very rich so you don’t need huge portions. The book says it serves 4 – we have big appetites but I’d say it serves 5.